personalised gifts for the new baby. All of our quality designer new baby candles can be personalised with the child's name, date of the birth as well as the birth weight. Create a wonderful keepsake today to cherish the memory of that special moment when your bundle of love came into the world. Celebrating the birth of a new baby is an occasion that surpasses any other. It marks new beginnings and beautiful changes in the life of the parents. Brinley Williams wants to help you cherish these memories using our variety of special new baby candles. Whether your newborn is a girl or a boy, we have just the light candle to suit you. 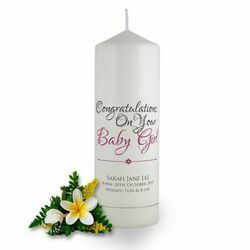 To top it off, our new baby candles can be a delightful keepsake gift, complete with the baby’s name and an optional personal message in their honor. The candles come in design colors of charcoal, bronze, burgundy, Emerald and many more. Our sky blue and soft pink colors are perfect for your little girl or boy. Brinley Williams new baby candles are a great gift for a baby shower, new arrival, naming day or christening: the most unique thing about them is that they are true to life and have that smoothing, wonderful feel that gently cleanses the spirit and gives it a soft touch of innocence. New baby candles will enhance your décor for your child’s reception party serving as both classic and contemporary. They also have the ideal combination of height, color and true Brinley Williams tradition. The one of a kind design of our new baby candles reflects a warm, relaxed sense of style that’s always at home.